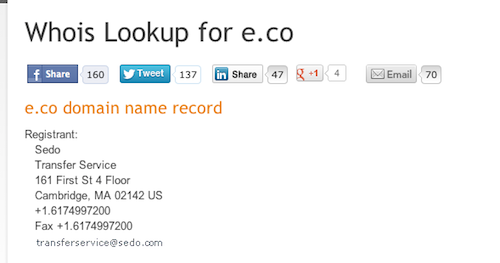 According to current Whois records, it appears that the e.CO domain name was recently sold by B52 Media. The domain name is currently registered to Sedo’s escrow account, which would indicate that a sale recently took place. I am not sure who acquired this domain name, but once the Whois information changes again upon completion of the sale, I will follow up (unless the registrant is uses Whois privacy). I reached out to Lonnie Borck, CEO of B52 Media, and he couldn’t offer a comment on the status of the e.CO domain name. Lonnie’s company originally acquired e.CO for $81,000 in 2010 at a charity auction run by Sedo and the .CO Registry. I was at the auction with Lonnie, and I always felt he would make a great ROI from this acquisition. In the past three years, Lonnie has turned down many inquiries for the e.CO domain name, and I am sure he got a solid number for this domain name asset. Congratulations to Lonnie on this apparent sale. His company still owns great domain names like Funding.com, Winter.com, Shock.com, and others. E.Co Back Up For Sale But Now The Price Is $500K reads a 2010 news. We are in 2013 and it must have crossed this massive figure. Yeah, Sourced from that. But, if it has failed drastically to have that number then it is really a matter to ponder upon. I don’t think the price will be publicized. Whois has now changed and it looks like someone in China bought the domain name.